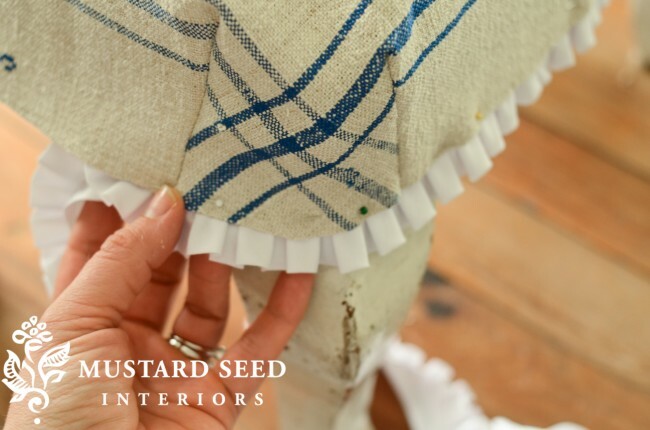 Home How-To	Make This Easy Ottoman Slipcover with Marian of Miss Mustard Seed! 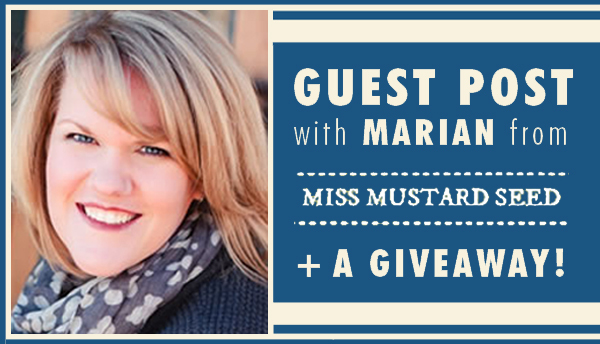 Today we’re beyond thrilled to welcome the incredible Marian of Miss Mustard Seed to Fresh American! 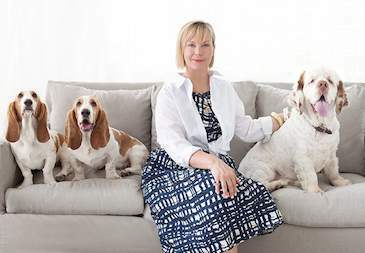 We’ve been huge fans of her for years (can you say milk paint maven? ), and couldn’t wait to see what she had in store for a guest post. 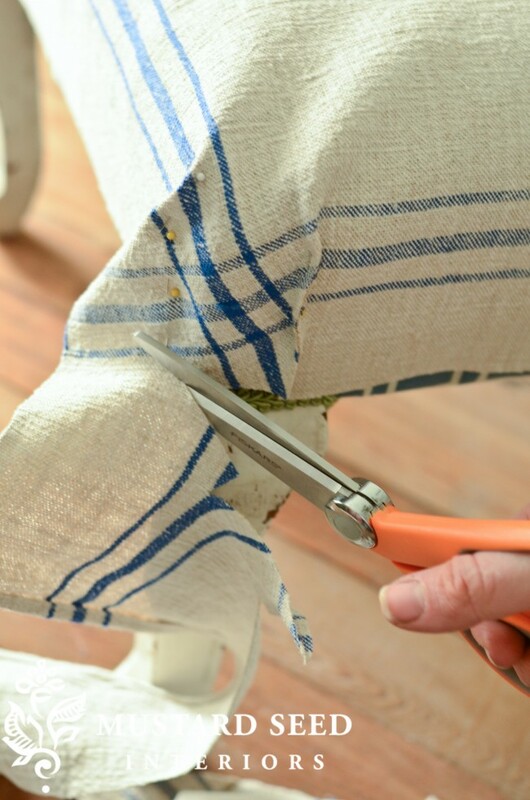 Check out this simple-to-make ottoman slipcover using nothing more than a tea towel, some trim, and a little thread. I love small home décor projects that can be completed in less than an hour with inexpensive materials. It’s instant decorating gratification! So today I’m going to share one of those projects with you—making a stool/ottoman slipcover out of a linen tea towel. This project can be adapted to work for chairs and barstools, as well. You can even get fancy with ties for the legs, a hand-painted or embroidered monogram, ribbon embellishments . . . whatever works with your style. The options really are limitless. 1. 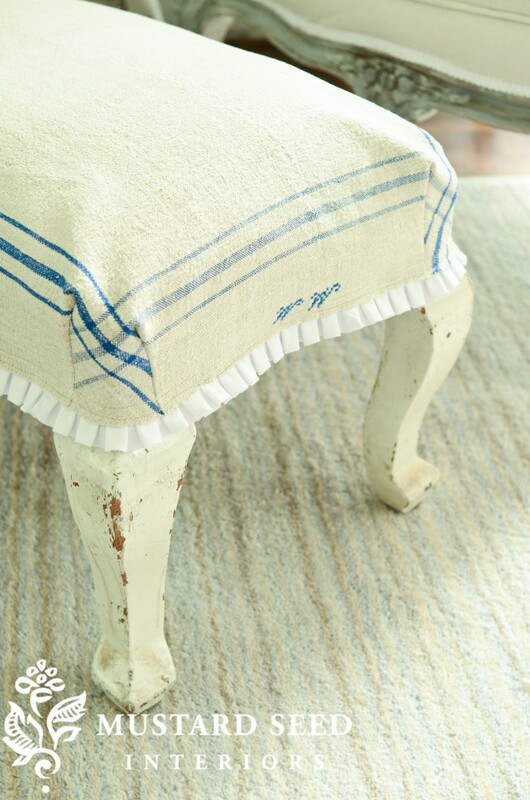 Spread the tea towel facedown on the stool/ottoman. Make sure it is lined up and even on all four sides. Pinch fabric on either side of each corner to make darts. Pin in place. Fabric should be fitted to ottoman once all four corners have been pinned. 2. Cut away excess fabric with sharp scissors. This seam will be exposed, so make sure cuts are straight. 3. Sew darts on sewing machine, and remove pins. 4. Turn slipcover right side out and fit onto stool/ottoman. Tuck pleated trim under fabric edge and pin in place. If fabric isn’t tightly woven and will fray, turn fabric edges under when pinning. Allow trim edges to overlap by about ½” where ends meet. Sew on trim and remove pins. Cut loose threads and iron if necessary. I hope this simple project has inspired you to try something similar in your own home. For more project ideas, visit me at my blog. Want to embellish your home? One lucky reader will win a $100 shopping credit toPineConeHill.com! Check out the Rafflecopter entry form below for 4 easy ways to enter! Contest ends on Thursday, June 20 at 11:59 p.m. EST. View the full details. Congratulations to our winner, Cindi from Illinois! This is really inventive! All I need , though, is the vintage ottoman. Any idea where I can pick up one online? I am going to attempt to reupholster an antique settee! So cute…can’t wait to try this! I should have done this for my ottomans that my cat loved to claw. Great idea! Always love Marian’s work. Cute slip. What a fun idea. Super simple and lots of style! Looks easy, just my speed! Great project. I just love the simple ones that look fabulous. Love it, want to learn how to do it! My next decorating project is a faux roman shade for the kitchen! I love fabric and i love Pine Cone Hill! Just love this tutorial, I have a similar ottoman. I had been at a loss on how to update it, and now I have a great idea. Thanks. I just completed a couple of really simple bolster pillow cases from an old regular pillow case! My current decorating project is wallpaper in the guest bathroom. Our children have long since gone and the room needs an emergency makeover. Not sure what paper yet, but I tore large pieces of the old wallpaper off the wall so I’d be committed to the project! Wish me luck! Thanks for the contest! Don’t we ALL love Pine Cone Hill and Miss Mustard Seed? Already commented, but didn’t mention any projects. Have been living in our farmhouse for almost two years, and the whole house needs updating. EVERY room. Thankfully, it’s all good bones, just needs some cosmetic help. That is a great project. Love this. I need to do a bedroom makeover. Fun to do this in my guest bedroom! Love all the bedding – since my bedroom is half done would love to win! Thanks so much for a chance to win this gift card…I could really use some new bedding. 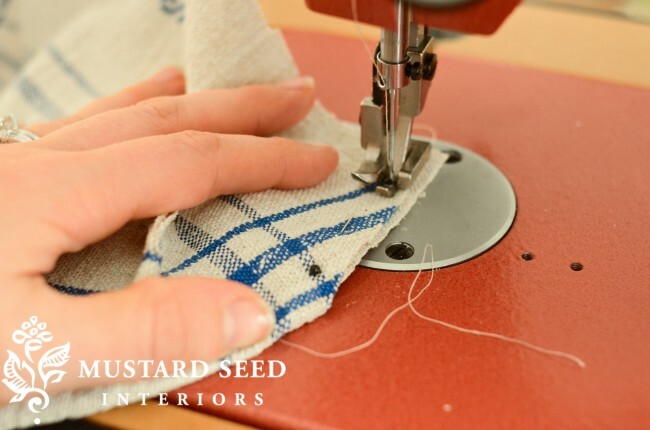 What a great project – Miss Mustard Seed always provides great inspiration! Would love to win! This is lovely! I hope I win! I have so many vintage linens. I’ll have to try this. I have a French caned chair ready to upholster. I have picked out this pink and green paisley for it. And, I bought plenty for curtains for the bathroom. I just need some time to focus without boys asking me about the next thing. I also am finishing up an old 40’s bookcase in rustoleum red. I call it my Chinese red bookcase. My boys loved the transformation! Its always nice to see someone enjoy what I enjoy. I have a chair that I want to slipcover. I would love to win this and start the re-vamp of our master bedroom! Would love to get the $100 to spend on you site! Working on furniture for the garden. What a great way to repurpose a tea towel! Even the little ways you can reduce your footprint make such a difference. Doesn’t hurt that it’s insanely cute!! Love Miss Mustard Seed and all her projects. Love Marian and all her ideas! Thanks for offering such a great giveaway! I’m in the process of re-doing my bedroom and would love to have some new bedding! I’m working on the parlor – changing from sage greens to grays and some brights. I need to finally commit to curtains and paint colors for our family room, after living with builder beige for almost 6 years. Blah! Next decorating project – the half bath on the first floor. I’ve been leaving it for last and need some ideas. Off to Pinterest to browse! I bought a little travel trailer at the river this year, re-doing a lot in it, especially the décor, going with lots of blue and white, just what you offer! working on our dining room chairs I found. taking a while! This couldn’t be easier! Must try it. I am working on a quilt to hang on the wall. There are so many projects to do, but slipcovers for my dining room chairs would be at the top of the list! Love this tutorial, I think I could actually do it! My next project is painting my kitchen cabinets. Lord, help me! Love love Miss Mustard Seed….. The kitchen will be getting painted and new flooring. Yeah! Oh goodness, so many but I have an antique french cane daybed that needs the most attention! We are restoring a small farm house in Michigan! looking forward to doing some slipcover projects!! I love this project. I have a larger hand me down ottoman that belonged grandma – this would be a perfect & easy way to update the 1980’s peach fabric. I’m not the best sewer in the world, but I think I might be able to pull this slip cover off…and I have the perfect piece to experiment with! Thanks for the tutorial. ps…LOVE the Pine Cone Hill bedding! I’m doing a complete redo in both bedrooms. Not sure what I’m going with so could use this to get a jumping off point! The blue and white bedding is so fresh and pretty! I recently purchased a old home built in 1912 that requires a total renovation. 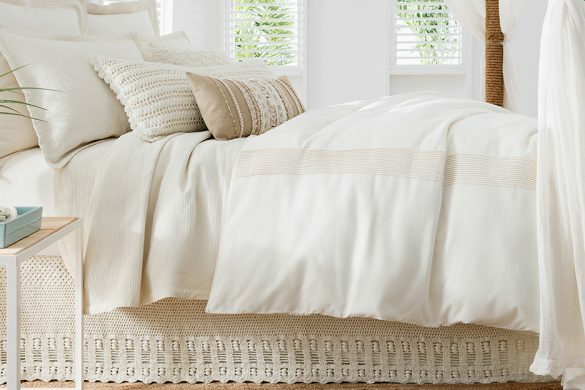 What joy it would be to have bedding that is from natural fabrics and so soft for my bedroom. I am renovating with “of that period” furnishings and remodeling supplies. Thank you for offering this wonderful gift to one of your faithful followers! Love this Blog. I’m working on my downstairs bathroom and kitchen. looking for linen sheets for my bed. Pine Cone Hill…HELP! enter me in the giveaway please! thank you for this inspiring post. i have some slipcovers to make and need a boost to get me onto it. this looks easy and is quite elegant. I have a super comfy recliner that has great bones but needs to be recovered! Love the products. So charming. Almost too cute to put anyone’s feet on. Maybe me, but no boys! Haha. I am reupholstering a chair for the first time. I am sewing curtains and DIY-ing my curtain rods….thanks for the fun giveaway! I am one of those women who has her hands in several projects at once. I am currently making pillow covers, painting a step-back cupboard, building a headboard bench (for a client), and re-decorating a small shop (for the owner) where I currently sell my vintage goodness. thank you so much for this opportunity to win credit to use at pine cone hill. love the timeless patterns and designs that you offer. I have an old set of nesting tables that I want to revive with paint. Curtains! Oodles of curtains are on my to do list. I am in the process of planning a kitchen makeover. There are so many choices that it is a bit overwhelming. I love this idea! Can’t wait to try it myself. Thanks for the chance to win the gift card too! Dreamy, simply DREAMY! I even LOVE the towel!!!!!!! 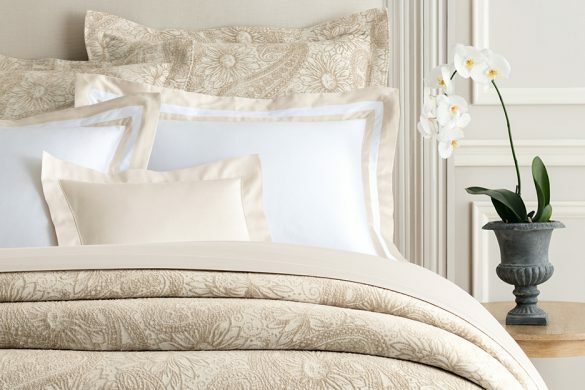 I love me some beautiful bedding! This is a great tutorial! It will come in handy when I reach the point where I can reupholster my living room furniture. Right now, the main project on my To Do List is to paint walls and trim in the living room. Hoping to start next week (fingers crossed). I’m working on getting some of “those” projects out of the basement. I have a whole living room re-do coming up this summer. So many ideas floating around in my head and not really sure where to start! Thanks for all of the great inspiration! This slipcover turned out great – and I love your site Annie! I wish I had done something like this on my white foot stool. I have a dumpster rescue footstool that I would love to do this on! Can’t wait – thanks for sharing!! This weekend I am rearranging my rooms and freshening up with pillows and light throws to welcome summer! So cool, thanks for the ideas! I live in a log home/cabin in Alaska on 20 acres. I love how it is decorated, but I need color. So I am trying to decorate with more color. Any ideas or suggestions would be appreciated. Just finished up a pillow cover with Annie Selke fabric this week. It’s so cute! Would love to add more of your fabulous designs to my home. Thanks for the chance to win! I am redoing my home office!!! Beautiful! Love everything she does! I am trying to work on my dining room, I am wanting a more cohesive look, I have to many mismatched storage pieces….my mothers buffet, an old pie safe etc. Painting inside of whole house…which leads to new furniture, pillows, throws!!! Over a year ago my husband and I purchased a foreclosed home with the intention of renovating it and then moving in. Well, it turned into a complete gut of the interior as well as all electical, plumbing, etc. We are FINALLY getting to the fun part; choosing colors, flooring, fixtures, etc. I love so many of your designs and color groupings. Picking one would give me a jumping off point to plan the rooms around. I would love that!!! Yes, I would love to win new bedclothes for my new home. I love this idea, so simple and easy. I am going to be making my own slipcovers for sofa, chair and ottoman soon. All white which I love with many blue and taupe colored pillows. I do have a stool that i could use this idea on and can’t wait to try. still working on a bedroom project! nearly done! Looks so cute and simple to make, I should be able to handle it even with my limited sewing skills!!! This is a great, simple project. Thanks! I would LOVE me some Pine Cone Hill! Very sweet, and looks easy. My bedding is so faded! Definitely ready for a makeover! I am planning on making new kitchen curtains using a retro fabric, and new living room curtains using cotton canvas . Love your blog! 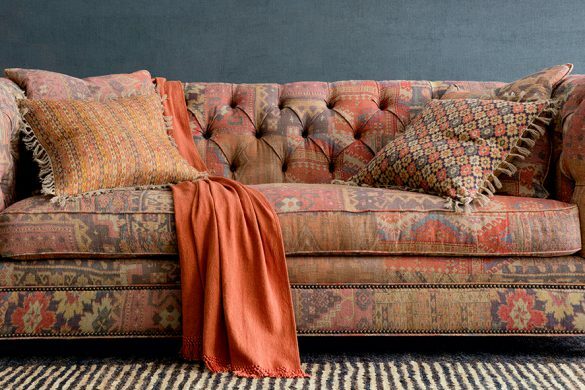 It is uncanny, I have an ottoman that really needs this slipcover! Thanks! I have been a fan of Pine Cone Hill for a long time. Such wonderful bedding!! Thank you for a great giveaway! I love Ms Mustard Seed and would be thrilled to win this giveaway. we are moving into our new custom built home in August so the timing would be perfect!! I’m so glad that Ms Mustard Seed sent me your way. My next project will be my bedroom. I would love to win this; have some Pine Cone bedding and love it – need an additional pillow and this would help. I’m redoing my bedroom – l love these fabrics and colors! I have a small ottoman I’m going to try this on. Just love this beautiful project!! I love Marion’s slipcover!! I would love to win a contest!! Thanks for making is possible to sign up to win your contest!! 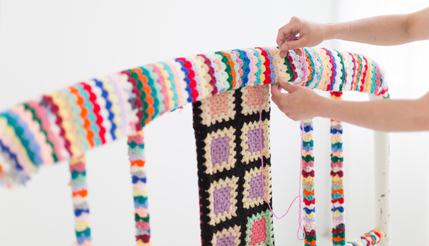 I am definitely pinning this project… I love it!! Such a cute ottoman cover and the bedding is gorgeous! What a fabulous idea. I’m going out to find one today. And oh be still my heart. I love pine come hill dash and Albert and Annie Selke fabrics. 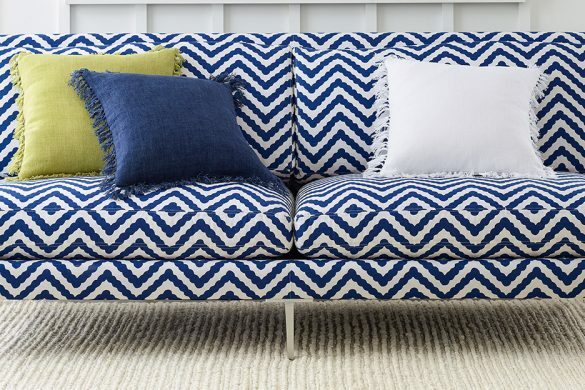 Just redid a cool Swedish daybed in the green and blue Nordic print. She makes it look so easy! Love it! I just finished laying a new floor, repainting, and adding some new decor to my son’s room. Now it’s on to the office/craft room (I’ve been dreading this room the most). I’ll be organizing and finding useful furniture to make this room more functional. Great DIY … beautiful bedding! Would love to win your great giveaway!! THis is beautiful. I love the tea towel. Wish I could get ones like this in Australia. Might have to check out Pine Cone Hill? Do they ship to Aus? I am working on a book shelf using Annie Sloan chalk paint. Love this tutorial! I have an ottoman that I will now conquer! Looks like a great blog! My master bedroom is on the summer to-do list! How cute is that!! I don’t currently have a little ottoman like that one, but I don’t see why I can’t make it. I would just get a piece of 3/4″ plywood and use 3″ piece of foam and some batting and cover it with that adorable fabric. Finding the legs would be the challenge but I’m sure I could do that. Looks like a fun project. I’ve made ottomans in the past and they aren’t all that hard to do. Thanks for yet another GREAT idea!! I would love to win the credit and purchase a new cover for me bed. The washing machine ate my beautiful comforter this past weekend. I love your craftsmanship. I love this idea! My decorating to-do list is full, since we’re about to move into our very first home! I’ll be painting walls, adding crown molding, sewing curtains, and lots more! I would love to win this gift card. It would go a long way toward decorating my new home! Glad that I found you through MMS. I love this giveaway! Count me in. Always have many projects going, but the next one I’m starting is painting and reuphostering an old wood frame chair. Going to use an antique coverlet for the seat and back and I can’t wait to get started! 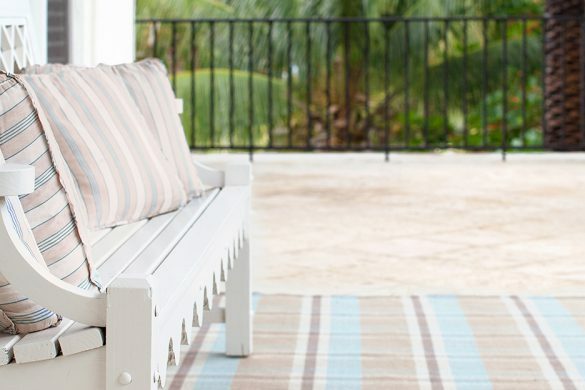 My Dash & Albert rugs are waiting for their perfect partner…..PineCone Hill bedding. ooops…a project that I am working on right now, is making a padded headboard!! Darling ottoman! It looks like something I could actually do! I’m off to get a tea towel! I love the tea towel look. Even better is the step by step instructions! I have a Very old, small chair with little curved wings. The seat has the original cracked leather cover over mohair. I’m thinkin bout using a stained tea towel for the seat cover… Whaddaya think? I ordered 4 cans of Annie Sloan chalk paint last night! I am painting the furniture for my 1st grandbaby, due in late September!! My daughter and I painted the nursery last weekend-we striped one wall using ASCP in French Grey and it looks so great! 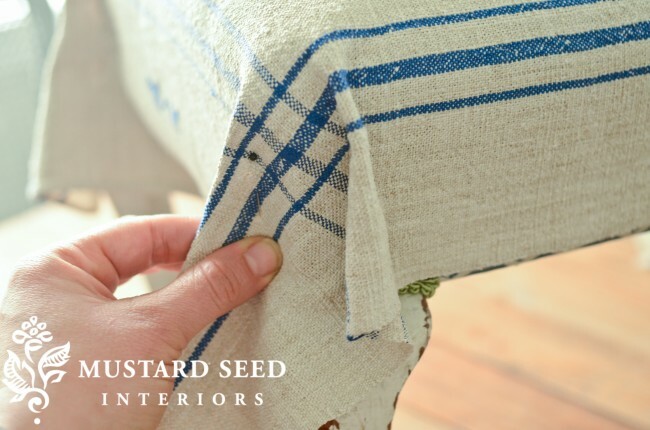 Love the tutorial, Marian, on how to slip cover an ottoman using a tea towel-I think I’ll use a tea towel to recover the seat of a rocking chair for the baby’s room-so sweet! 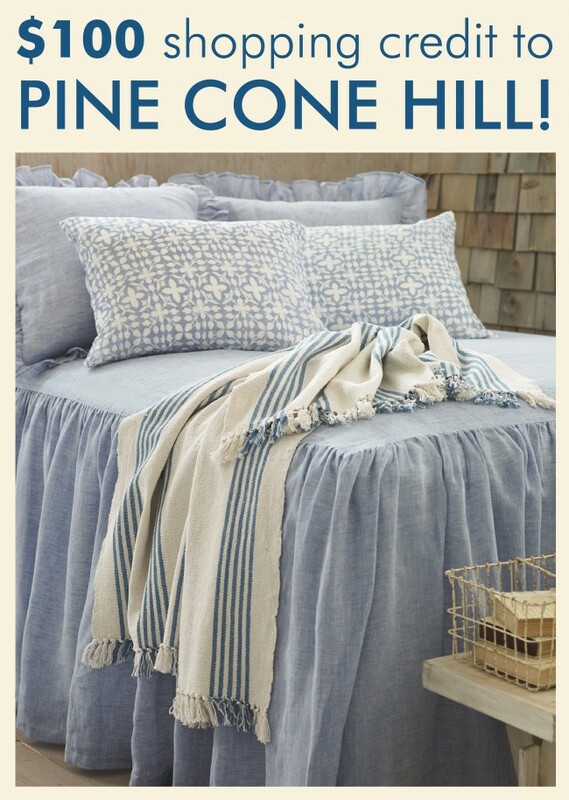 I am SO in love with that chambray bedspread pictured in on the Pine Hill website and I SO want it to be mine! Painting a hair, table, and stool inMilkPaint. Love’n it! I am always painting furniture! Curtains all over the house. Wow! Love this idea. Fantastic tutorial by the very talented Marian! I love the little ottoman, and the lovely blue and white bedding. I plan to paint a corner china hutch I bought on craigs list. Working on our combination dining room/workroom; formerly a screened in porch. I’m embellishing store bought curtains for the living room and dining room. I love the slipcover. Sew simple !!!!!!!! Thank you for this wonderful giveaway ! And a great idea on the footstool. I have one that needs a makeover and this is sweet…if I can find the right fabric. I don’t Tweet, but I’ll take this chance to win. I’ll go pinterest, too for an extra chance! Love this idea. Cant’ wait to try my hand at it! What a generous giveaway! Fingers crossed that I can finally get something I’ve had my eye on for ages! Trying to figure out what to surround my fireplace with…stone, tile, ??? That’s the next big project. Thanks for the giveaway!! My next decorating project is painting my sideboard pewter and putting on crystal knobs. Oh my goodness! The bedding is just lovely – the blue and white looks so fresh and inviting. I’m going to redecorate my master bedroom this summer and would love to win! Thank you for the great giveaway. Oh my goodness! The bedding is just lovely – the blue and white looks so fresh and inviting. I’m redecorating my master bedroom this summer and would love to win! Thank you for the great giveaway. My guest bedroom really needs refreshing. Your bedding is lovely and would be a perfect choice! Husband said once the garden was planted, he would paint our bedroom. Deciding on paint color presently. What a perfect topping for a family footstool I inherited—might even be able to use part of a damaged vintage tea table cover instead of the dish towel. I could certainly use some embellishing in my bedroom! I need to paint my Master Bathroom. I am currently redoing a vintage camper! I have so many ideas floating around in my head but this slipcover is really cute and the scale is right for my “baby”. Since we’ve recently moved into a new house we have had all kinds of projects going. The newest project would be a quilt that I started last week. But I desperately need some new curtains for the living room. I think I’ve made up my mind on what I want to do. Maybe. Craft room/bedroom update. Thanks for the opportunity! Which decorating project do I NOT have? I need to work on my walls. I have so many cool things to hang, but it’s so hard for me to make holes! I am in the process of painting a 90 year old doll cupboard. My grandfather made it for my aunt, then my mother had it, me, and now it is almost ready for my grandaughter. On my to-do list is to redecorate my sewing room. I’ve gotten it painted and bought the fabric to recover the futon. Maybe I’d buy some gorgeous pillows for it if I win this gift certificate. I need to work on my bedroom. Love this, she makes it look very easy! I am working on some pillows for my sofa. Curtains, shades and pillow covers are along list for me! Love Miss Mustard seed! She’s always brilliant when it comes to beauty! I have a high four poster queen sized bed that is crying out for new linens. I’d love to win! I just found some vintage tea towels in my mother’s attic and an ottoman covered in uncool fabric…my next project! I just finished making a dropcloth slipcover – inspired by Miss Mustard Seed. I am inspired continuously and love Pine Cone Hill ! I’m working on a reupholstering a chair right now! Love this opportunity to win! I’m always working on something around my house. Would love a shopping spree! I would love to refresh my bedroom decor, which I have had for about 20 years! Hmmmm….. In which room should I start? Let’s move the master bedroom to the top of the list. Wouldn’t it be pretty with help from Pine Cone Hill? Newly built home, have several bedrooms to decorate! I have a beautiful old dresser with beautiful legs that I want to paint….but can’t decide if I want to paint it pure white or Paris gray chalk paint…or do I want to try MMS Milk Paint. I haven’t tried it yet, but I am dying to. I also need to slip cover some chairs, and love the grain sack look…oh, so many decisions! Love your style! Love Miss Mustard Seed’s too. 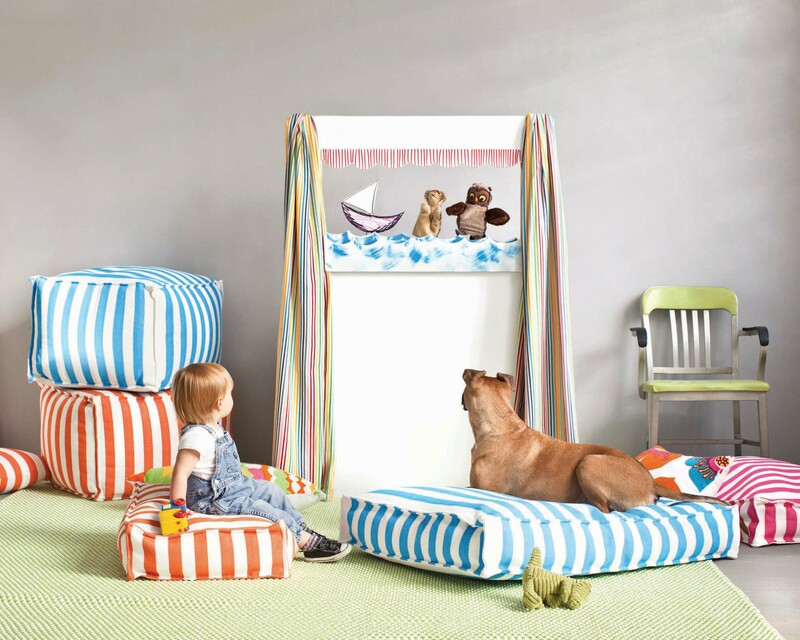 Great idea for a footstool cover and easy too! Thanks so much for the offer of the giftcard to Pinecone Hill! The tea towel tutorial is so cute and looks easy. Would love love love some new bedding from pine come hill. I love this idea with a vintage towel! Great company with terrific products! Thanks for the chance to win! Actually Im working in redoing my bedroom. I have a long version of this stool that I’ve been meaning to tackle………….now I have the knowledge to make the slip cover. I had no idea I could buy the pleated trim already made. YEAH!!! Can’t wait to start, love Miss Mustard Seed. I love anything Pine Cone Hill! This whole time I was getting so frustrated because I couldn’t make that small pleated trim! Oh my goodness it’s pre-made.Stooooopid!!!! I’m working on my master bedroom. I have dark furniture that I have been waiting to have the budget to replace. Sine that budget has not materialized in the past 15 years lol, I am going to give the set a milk paint makeover. I have materials for an upholstered headboard. I will be painting the walls and trim too with some new window treatments (just not sure if I will try my hand at making my own curtains or not). I hope to make the room feel likethe sanctuary it should be rather than the last room on my list that gets whatever is leftover. Thank you for your inspiration! I’ll be getting the sewing machine out today. Love Pine Cone Hill, would love to order that beautiful throw! Thanks for the giveaway. Pine Cone Hill bedding to go with my new Dash & Albert rugs. The perfect pairing. I’m currently redoing our great room and kitchen. This would be a big help. Thank you for the chance. Perfect timing! 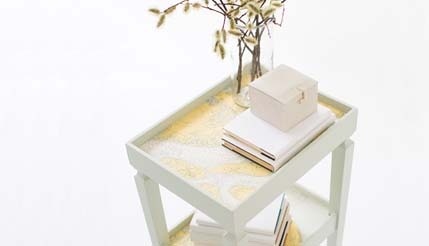 I am about to tackle an ottoman project and this makes it so easy and cute! Thank you! That pine cone hill bedding is beautiful! I’d love it for years and years! My ‘to-do’ list is currently 13 pages long! A bit intimidating for sure, but we’ve fallen very far behind with our home maintenance because of health issues, so it’s time to bite the bullet and start working away at the list! I would love to slipcover our couch – I’ve made lots of slipcovers for others but never for myself! It’s time! I love the stool project!!! Will be pulling out my seeing machine. Sounds like a fun weekend project. I’m so excited to try this one. May turn it into a Father’s Day gift! Great tutorial! Love this style – I’ll be bookmarking this page for sure! I love this project – it looks like one I could tackle in a short time period and enjoy immediately. It is one too, that I could try with my oldest daughter to let her help me. Thank you for sharing! Nice tutorial. I don’t have a stool to cover but I think I apply it elsewhere! I have lots of spray painting projects to do right now! Thanks for the chance at this great giveaway! I just found a nice, plain white pillow at a thrift store for $1, and I’m going to do a lettering / painting project with it for the sofa in our camper. What project don’t I have going on? Too many projects, so little time. I want to try my hand at sewing a slip cover for a chair I bought from a on line yard sale in my area. I am needing to make a few pillow shams for the master bedroom. What a quick and easy facelift. I can’t wait to try this one myself. Where to begin? I have so many projects on my to-do list but I think the next one I’ll tackle are some pillows and a bolster. Always looking for new ideas to fix up the house. your lovely bedding sets would be my first choice! I have several things on my plate for the summer, but my twins’ room is top on the list! My kitchen is next on the “to-be-done” list. I can’t wait to go antiquing this weekend. Maybe I will finally pick up some of the vintage linens I’ve been too intimidated to get before! We just moved into a new house, so every room is on my decorating list! Always looking for easy tutorials and super cute ideas! Now, if I only had a footstool….hmmm, I see a shopping trip in my near future! Isn’t that footstool the cutest thing?! time to paint and redo several of the rooms! I found you on Miss Mustard Seed’s page. I’m always looking for blogs with good ideas. I’ve been meaning to re-paint the $5 church sale mid century cabinet we use as our tv stand. It has nice lines, but really does need an update. Have sooooo been longing to have this amazing bedding to revamp my bedroom! Would love & treasure it!! Our 1897 home, built by my husband’s grandparents, will be getting a much needed new roof and a complete kitchen and bathroom redo when we replace the foundation on the back part of the house this summer. Looking forward to picking out all the new cabinets, flooring, lighting fixtures, faucets and, of course, rugs, window coverings and shower curtain. 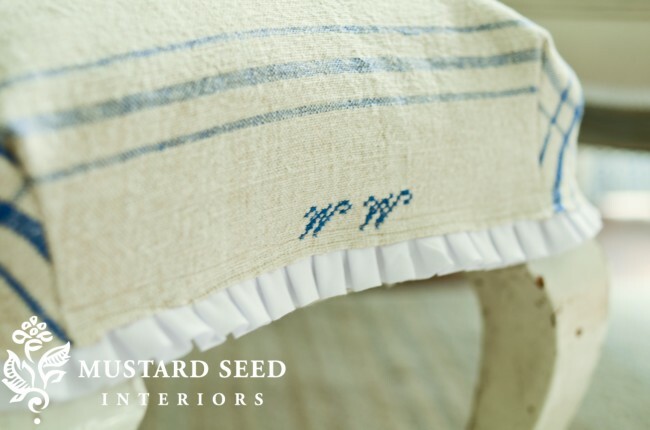 I love Pine Cone Hill Bedding and Miss Mustard Seed! There is a little shop near our town that carries Pine Cone Hill Bedding that is so beautiful! I’m remaking my son’s room into a guest room and I’m so excited!! He is the first of my 4 kids to go out into the world!! I found a 4 poster bed to paint and I’m painting the floor white!! Still looking for an armoire! Of course, my girls are making plans of claiming this room!! Thanks for the chance to win!! Currently, I am working on redoing a guest bedroom in tone on tone. The next room is my master bedroom. I really need to update my bedding. My next decorating project is definitely something involving mason jars! I need one of these for my extremely tall bed! I need to decide on a style & buy a curtain rod for my bedroom so I can hang my curtains! Then I have plans for an upholstered headboard! Like the post above says…perfection! Your fabric style is equivalent to her paint style. Beautiful! I have just taken over a bed and breakfast that needs updating. I need all the help and inspiration I can get! SewSimple! So Fresh. I am going to cover my little foot stool today. Just had two chairs recovered. My project is accent pillows with some fabulous New Mexico Museum fabric in turquoise, browns and cream…can’t wait to finish! we’re still working on painting our kitchen; old farmhouse + lots & lots of trim = much work, but oh, such beautiful & character-filled it will be! My big organizing project is the kitchen! Love the vintage linens. and to answer the giveaway question I have a ton of projects in the queue. Hamper liner, several furniture refinishing projects…it’s a never ending list! working on my living room now…always looking for ideas. thank for this! What a great use for all my family linens! We are moving in 6 weeks from a cape cod home to a condo. Our present home is perfectly decorated and although I will miss it, I can’t wait to start over again in our condo. My husband and I am busy painting, using colors we haven’t used before. I think our library/den will be first on our list. We are painting a cabinet for our tv stand in turquoise, a new look for us. Can’t wait to start. I’m going to attempt to make some euro shams for my bed and I have several pieces of furniture to paint. Thanks for the giveaway! Thanks for GREAT giveaway. I love Pine Cone Hill mdse.! we just bought a new home last week, so we have MANY projects underway. i’m so grateful that the DIY movement is so strong and there are so many ideas and how-to’s shared online. thanks for the giveaway and the lovely slipcover tutorial! I’m working on making a cottage sign on a old canoe oar. I am excited as it is a gift for my in-laws. Working on my bedroom. Great giveaway! Our basement bathroom is going to be our next decorating project. What a lovely project. I have a 1920’s club chair with those queen anne legs just like your little foot stool. I’m inspired. This will be a perfect way to spruce up some old footstools I have.Thanks for the idea. Such great ideas. Now I have a list of projects to do! I’m re-excited about my housel. Love this tutorial and the textiles chosen! I may have to use this in my sister-in-law’s master bedroom French cottage style redesign. I would be so happy to be able to choose something from Pine Cone Hill. What a treat that would be. Your products are beautiful! We have a new home for our retirement years. I have a ton of projects that I can’t narrow down. I really need to do up our bedroom. It’s boring! It needs some pizazz!!! I’m hoping to get throw pillows made very soon! I’ve been looking for a bed cover gathered at the top like this, so gorgeous! We have a baby on the way in November so we are looking forward to a lot of DIY projects! First on the list is a redo of an old dresser! Such a great idea, I can just picture my grandmother doing something like that years ago. I’m going to have to try it! Thanks for the great ideas! Love it! Definitely trying it this week! Amazing how such a small touch and add so much diminish to a piece. This has given me a wonderful idea on how to finish off my next project. I have a small ottoman that I am going to paint using MMS Milk Paint and I was struggling for a wonderful cover. Not anymore! Thanks so much! I am actually planning on painting 2 of my beautiful antique chairs. Redecorating our master bedroom with bedding that is classic and neutral but also very comfortable and easy to care for! I need to spiff up my bedroom. I’ve had the same decor for about 23 years! I have summers off and always create a wishlist of to dos…but this year my main project is to simplify! Paint, recreate, recycle and donate until what is left is a simple, cozy home to live and enjoy life in and out of! Marian always does a beautiful job! Wonderful inspiration! Thanks so much for the awesome give-a-way opportunity! I have a vintage mirror with a lovely frame that I want to redo in a cottage style. I am redecorating a bedroom for my grandchildren’s sleepovers! an old cabinet that needs some tlc that will go in our kitchen to hold cookbooks! can’t wait to get that one checked off the ‘to-do list’! This seems to be a really easy, inexpensive and quick project to do. I don’t do a lot of sewing, so the easier, the better. And I happen to have a little ottoman with curvy legs that I want to “dress”. Thank you so much! Nice to have found the Fresh American blog through MMS. I’m a new fan!